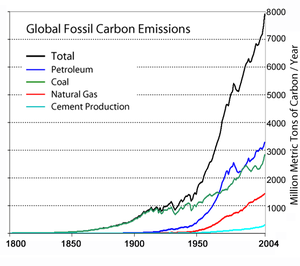 It’s hard to miss statistics about carbon dioxide (CO2) emissions these days. News stories about CO2 emissions have grown in frequency as scientists increasingly sound the alarm that anthropogenic global warming is indeed happening at an accelerated rate, largely due to increased CO2 emissions. For example, a New York Times article in March 2012, “For New Generation of Power Plants, a New Emission Rule From the E.P.A.,” describes new draft standards from the E.P.A. for coal power plant emissions. “The draft rule would limit carbon dioxide emissions from new power plants to 1,000 pounds per megawatt-hour,” writes the author. One thousand pounds of carbon dioxide. But what does that look like? Even for engineers, it’s difficult to visualize. The first challenge is in our everyday lives we usually think of liquids (and gases) in units of volume rather than weight. Try visualizing 8 pounds of water. But a gallon of water weighs eight pounds, and we can all visualize a gallon jug of water. In writing this blog post, I had to go back to high school chemistry, dredge my memories of units of measurement like moles and check a variety of web sites with a spreadsheet. (I did find some errors out there, so be careful when using conversion sites.) I am not going to repeat the math here, but I found the Federal Fuel Economy website to be useful. A gallon of gasoline weighs 6.3 pounds. When it is combusted, the carbon combines with oxygen and the weight of the CO2 emitted is 20 pounds. Wondering how big 20 lbs of CO2 is? 20 lbs of CO2 would fill 1200 gallon jugs. If we had an image of this it would show a single gallon of gasoline on the left, a fire in the center and a stack of 1,200 gallon jugs filled with CO2 (an invisible gas) on the right. The combustion of one gallon of gasoline generates about 1,200 gallons of CO2! The CO2 would fill a space that is about 5-1/2’ by 5-1/2’ by 5-1/2’ or 165 cubic feet. How big is a ton of CO2? A ton of CO2 would fill a modest one story ranch house with a footprint of 1250 sq feet and an average height of 13 feet. What size house does my car fill every year? My Honda Civic Hybrid emits approximately 4 tons (US tons, 1 ton = 2,000 lbs) of CO2 for the 16,000 miles I drive every year. But tons implies weight and we don’t see chunks of carbon falling from tail pipes as we commute to work – so how can we visualize the gas we are putting into the air? The four tons of CO2 emitted by my car every year would fill twice the volume of my 2,500 sq ft ranch house. That’s my one, efficient car driven 16,000 miles per year. Our family owns and drives three cars: my Civic, my daughter’s Prius and my husband’s Tacoma pick-up truck. Together we need a single story ranch house that is 11,600 square feet in size to hold the 9 tons of CO2 generated by our driving each year. billion metric tonnes of CO2. To understand how much gas this is, imagine the state of Connecticut (5,500 sq miles) covered in a 3,200 foot thick blanket (a 0.6 mile thick blanket of gas). It seems helpful to try to visualize the impact of fossil fuel combustion as we try to move our society toward more resilient options like efficiency and renewables. When discussing this with my family, we thought vehicles ought to have some kind of balloon that shows the emissions. My daughter suggested converting the CO2 back to carbon before it exits the tailpipe and putting it back in the ground. Sequestration certainly has an appeal, but we all agreed that eliminating emissions at the source is the best approach; then we left the restaurant in two separate vehicles. It’s awfully hard to change, even when we know the negative impact of our actions.